Statement the Serbian Anarcho-syndicalist group ASI presented to the International Workers Association Congress in 2009 on the states attempts to fit up six anarchists. In the night between 24th and 25th of August 2009, some time after 3am, two Molotov cocktails were thrown on Greek embassy in Belgrade. Act ended with a damaged window and minor damage to façade, the fire didn`t spread to the interior of the building and small fire that was started was quickly extinguished. No one was hurt in this `attack` because there were no people at the embassy at that time and on the following morning all embassy services started working on schedule. Greek embassy officials stated that the damage was insignificant – `Embassy is working without any problems. We`re issuing visas and we`re working with citizens as usual`. Serbian ministry of interior (MUP) immediately contacted embassy officials to make sure that everything is in order, and condemned the attack. During afternoon 25th of August, until then unknown anarchist group `Black Ilja`(Crni Ilija) took over the responsibility for the attack and sent the following announcement to the media: "Our comrade Todoris Iliopulos, who was arrested during the popular uprising in Greece during December 2008, is at hunger strike for already 46 days demanding to be released. While trying to set an example to anyone who will dare to fight for freedom, Greek state is leading a fabricated process against comrade Todoris. Belgrade anarchists have decided to join comrades in Greece, and the whole world in actions of solidarity with Todoris, by demanding his release. That is why the members of our group attacked the Greek embassy in Belgrade with Molotov cocktails during the last night. We will continue with our activities until comrade Iliopulus is released! Fredom for Todoris! " Todoris Iliopulos was arrested on December 22nd 2008 during the unrest in Athens, which started after a 15 year Alexandros Grigoropoulos was shot and killed by a police officer in Excharheia district on December 15th. He was held in Koridlao prison from the time of arrest until August 28th, when he was let out on conditiona release. He is accused of two criminal acts (attack on police with Molotov cocktails) and few offences. All the time during his stay in prison, Iliopulos claimed that the charges against him were based on statements of police officers. He started his hunger strike on July the 10th this year, when his health and life were in danger after more than 40 days of hunger strike, a call was made on a number of anarchist webportals, on “Action for liberation of Iliopulos” and other activities such as propaganda, info-actions, meetings, discussions – with a goal of immediate release of Todoris. These actions were scheduled to start on August 24th at 8pm. The president of Serbia, Boris Tadić, has condemned the incident and in a conversation with Greek ambassador in Serbia, Dimostenis Stodis, threatened that the state will take all necessary steps to find and adequately punish the offenders, which announced the political process which will e held against six Begrade anarchists. The leading media in Serbia, have, by the order of state, started focusing their reporting towards making ideal circumstances neutralization and elimination of leftist groups as well as critical thinking in general. There were speculations of internationally coordinated terrorist actions via anarchist web-portals, after which the preparation meetig for Balkan Anarchistic Book Fair, which was held at the beginning of July of this year, was mentioned in the context of preparation for attack on Greek embassy, and finally a `source close with the investigation` has stated in the media that the case can be characterized as a terrorist attack, but at the moment no one can say that with certainty. `Good informed defense analysts` have also insinuated that the Serbian anarchists committed this act in order to be noticed by (demonized by the media) Greek anarchists ad by that get logistic and economic support from them. Zoran Dragisic, Assistant Professor of Faculty of safety and one of the founders of the new Social Democratic Party of Serbia, considered how it was an organized attack and that certain ideological and political intentions stand behind it: "Our security services should seriously address this group. Another problem is that the Embassy of a proven friendly country was attacked. All these left-wing and rightwing groups that resort to violence must be neutralized. Security services need to monitor all suspicious groups and then arrest those who committed violence. If the state can not stop them, it would be a sign that these groups are stronger than the state. We would then have to pay them taxes, not the state. It cannot be a question of whether the state can do this, it must! Anarchist as well as profascits groups are a serious threat to public order. From the security point of view, their ideological differences are irrelevant as long as they violate the law. It is necessary to urgently implement the arrest, court processing and impose harsh penalties, and the activities of the organization, must be under constant supervision, which is the work of BIA (safety and inteligence agency). "Dragišić also pointed out that such activities can evolve into terrorism, and shouldn`t be underestimated. Božidar Spasić (former head of UDBA) considers that the aim of this action was a atraction of attention of Greek anarchists: "Such an attack could not be done without a good preparation and monitoring of the Embassy, where the security and the building itself was monitored for at least ten days, where someone was sitting in the surrounding cafes and all carefully recorded. It is a worrying factis that there was no reaction from embassy security during the attack on the building, but also a cooperation between Greek and Serbian police in providing information about the anarchists in their countrie." He adds that: "the anarchists in Greece have gotten so strong that in addition to wing, they also have an economic one that deals with the abductions of Greek tycoons, businessman and attacks banks, and thus acquire a huge amounts money used to finance the attacks. Because of that they are classified in rank with the most dangerous terrorist organizations like ETA and IRA." Until `Black Ilija` case, anarchists in Serbia haven`t been known to the public by the violent and radical actions. Activities os Serbian anarchists were known to the general public are sharing leaflets in front of faculties adn factorise, spraying graffities, publishing, and organizing cultural events and discussions, as well as participation in the workers' and student protests. 1. The objectives of the activities are usually always political, whether it is a regime shift, shift the person in power, secession of certain territory or parts. 4. Lack of direct links between terrorists and victims, ie. attack is not directed towards the victim or victims individually, but the terrorist act would send a message to wider community. "at the moment when the rights and freedoms in Serbia are seriously constrict by enactment amending the Criminal Code and Law on Public Information, the initiation of proceedings for an act of international terrorism against the six arrested, indicates the intention of certain state structures that increasing the degree of repression and abuse of legal provisions gradually discourage any political criticism of its actions. Therefore, we express solidarity with the arrested, demand that the meaningless charges against them be raised and seek their release." Calling from a special antiterrorist unit base in Batajnica, Interior Minister Ivica Dačić said this is protest as purposeless and said that the police has evidence, but that the police is ready to admit that a mistake has been made if it is proven otherwise. For 11th September, a group of Belgrade University professors and public figures concerned with the announcement that against the six suspects for Molotov cocktail attack on the embassy of Greece in Serbia to be indicted that are they charged for an act of international terrorism, sent an open letter to the public. This group also said burning example of the U.S. Embassy during a protest after the declaration of independence, 21 February 2008, where the work with much greater consequences than seen much milder case of the Embassy of Greece where the effects were insignificant. The group alleges that the U.S. Embassy in Serbia was burned and that is substantially damaged by fire, while one of the attackers lost his life. "The only participant in this attack which is found on the accused bench was charged with serious offenses against the enforcement of general safety. In contrast, the authorities breaking a window at the empty building of the Embassy of Greece, with two lighted bottles that have not led to a fire characterized as an act of international terrorism, as the work of the Serbian Criminal Code is in the list of the most serious crimes such as genocide, war crimes and conducting an aggressive war." The signatories pointed that hey’re afraid that the paradoxical positioning of different law enforcement bodies under the two cases of politically conditioned parts of the current government efforts to improve the rating of the nationalist oriented part of the electorate. "It has a stimulating effect on the strengthening of the right extremist and chauvinist tendencies in our society, such as those that largely without major legal consequences, in early 2008 participated in the aforementioned burning of embassies in Belgrade" The international reaction to the arrest and accusing the Belgrade anarchists of International terrorism were more intense and frequent. The desire of government to criminalize ASI as an organization and prohibit it at the end, became apparent when, on September 15th, during a wave of creating atmosphere of fear, in some media an obviously false news appeared, how Anarcho-syndicalist Initiative will use "pride parade" to attack the police in the streets of Belgrade and avenge the arrested comrades. Events that followed, the Serbian government will use to open the introduction of state repression. Since the "Pride parade" was scheduled for September the 20th, tensions in the Serbian public scene grew since the spring, but have reached the culmination on18th of September evening, when a French citizen Brice Taton was brutally beate. He was kept in hospital for treatment, in critical condition, and the same night was, due to severity of his injuries, subjected to a series of surgical procedures. State Public Prosecutor's Office, "shocked" by violence, has condemned attacks on French tourists and announced that he will seek the strictest prison punishment. The "Pride parade" the following day, 19th of September, however, is prohibited with the explanation that the police and security services are unable to guarantee the safety of parade participants, and officials have stated that the State capitulated before the violence and profascist groups. The same day, police banned the holding of meetings in downtown Belgrade, under the pretext that it could lead to violent acts. Farce directed by the state, called the struggle against violence, was continued by the arrests of members of nationalist organizations "1389" and members of the clericalfascist organization "Obraz", due to the occurrence of unauthorized gathering. Interior Minister Ivica Dačić said that "the state will decisively deal with everyone who is threatening with violence and that public meetings cannot be held in downtown Belgrade, where there is a threat of endangering life and property. The police will, as much as it is in its power, prevent all kinds of attacks, and will be repressive to extremist groups that threaten the various parties, organizations and movements. " Officials of the police are once again emphasized that "and in the future" in the center of Belgrade, for security reasons will not be allowed holding of public meetings. "Police has on the 20th of September arrested 37 activists of rightwing organizations for violating ban on gatherings in public places, and four of them were detained in prison for up to 30 days. Ministry of Justice on 22nd of September launched an initiative to ban any organization whose members propagate violence and carry out criminal acts. And then President of Serbia Boris Tadić announces that "all extremists, left or right, will be prosecuted before our courts." In Article 55 Serbian the Constitution states that the Constitutional Court may prohibit the association which is aimed at violent overthrow of constitutional order, violation of guaranteed human or minority rights, inciting racial, national or religious hatred. Investigation ended after two months, on 3rd of November, prosecutor and the Belgrade District Court and the Trial Chamber by a unanimous decision filed for international terrorism against six anarchists from Belgrade, and extended their detention for another month on Article 42 paragraph 1 point 3 CPC (when punishable penalty for a crime is more than 10 years, the accused has no right to defend himself with freedom), while the indictment says that there is fear that the offense will be repeated because the defendants are members, and supporters of ASI. The list of actions is not complete. Will put a more complete list here in a bit! There were a few other small things, like banner drops I didn't include. I added a picture and fixed the tags: IWA group tag, and Belgrade 6 general tag. Worth noting that the London pickets were supported by AF as well, and people from lots of organisations came to one or other (which is quite a thing in London during the week) including (I think) A&S,L&S, FAU, Permanent Revolution and IBRT. Also add to the list of actions, Dec. 30 in Santiago de Compostela by CNT. 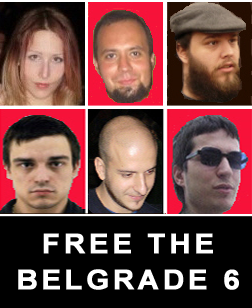 I am not sure if this is the best place to ask, but would supportive/sympathetic website admins - such as libcom.org, Anarchist Federation, IWW... please consider adding a prominent link on their websites in support of the Belgrade Six ? I know that the belgrade-6 tag has been set up here (thanks) and that afed.org.uk has the Another demo called against continued detention of anarchists in Serbia - London, Monday 28th September 2009 article which was attended by AF members, Autonomy & Solidarity and others. Anarkismo.net had the Belgrade 6 as a feature article for a while, but it is very difficult to find now. ¿Qué relación tienes con la ASI? ¿Mantenéis actualmente contacto? Soy miembro de la federación anarquista de Eslovenia (“Federación para la Organización Anarquista“). Desde hace más de ocho mantenemos una estrecha relación con les compañeres anarcosindicalistas de la ASI y ambas organizaciones hemos estado colaborando conjuntamente en las actividades en las que nos ha sido posible. Actualmente estamos en contacto con algún miembro de la ASI aunque la comunicación es más que difícil ya que están siendo estrechamente vigilados por el estado serbio. Sin embargo, ni nosotres ni les mismes miembros de la ASI tenemos contacto directo con les preses. ¿Qué sucede ahora mismo con les compañeres? ¿Eres optimista? Todo lo contrario, muy pesimista. Como podéis imaginar, actualmente la situación es muy frustrante para todes y se debe, especialmente, al hecho de que el estado serbio está absolutamente determinado a acabar con la ASI. Obviamente se están aprovechando de la situación todo lo que pueden. De hecho, a los largo de todo este tiempo se les ha ido prolongando el tiempo de arresto con la excusa de nuevas imputaciones. ¿Qué cargos se les imputan? a pasar a juicio. Si les declaran culpables, la condena oscilará entre los tres y quince años. Todo esto a pesar de que el fiscal no tiene evidencias legales y les compañeres lo negaron todo desde el primer momento. Hay que dejar claro que es común que el estado serbio aplique este tipo de condenas a las organizaciones antisistema con el fin de bloquear su actividad y presionar a sus miembros, para finalmente dejarles libres sin cargos. Pero, obviamente, este caso es diferente. ¿Cuál es la situación político-social en Serbia? La situación social es muy jodida. Por supuesto, Serbia se encuentra dentro del marco actual de crisis, pero además con el agravante de tratarse de un estado que está en transición entre el llamado socialismo y el capitalismo salvaje. La tasa de paro es mayor del 20% y aquelles que disponen de un trabajo viven con lo justo. El 60% tienen sueldos por debajo de la media (unos 350 euros/mes). Y esto sin contar a aquelles que cobran el sueldo mínimo (150 euros). Por otro lado, la situación dentro de las mismas instituciones es muy caótica. Hay diferentes centros de poder y todo tipo de mafias. La corrupción está a la orden del día. Al igual que en España, los partidos políticos son todos iguales respecto a las propuestas económicas. Sobra decir que a pesar de este caos institucional, el aparato represivo funciona a la perfección. ¿Qué influencia tiene la ASI en Serbia? Como todos sabemos, se trata de una organización pequeña, pero sin embargo cuenta con una gran influencia en la sociedad. Han estado ganando influencia en la opinión pública, entre les trabajadors y se han mostrado como la única alternativa a los sindicatos amarillos. Estaban siendo muy efectivos además de persistentes con la propaganda anarquista, con sus principios, tácticas y finalidades, y no sólo entre la clase trabajadora, también entre estudiantes, profesors, etc. Creemos firmemente que esta es la principal razón del arresto y damos por hecho que el servicio de inteligencia serbio está detrás del montaje de todo este proceso. Además me gustaría añadir que la ASI no tiene solamente influencia en Serbia, sino en muchos de los países balcánicos. Como en estos países no existe ninguna organización anarcosindical (excepto en Croacia) por el momento, elles son el referente. La ASI ha puesto mucho esfuerzo durante los últimos años en la necesidad de una organización anarcosindicalista. ¿Cuál ha sido la reacción de la población serbia? Muchas organizaciones afines se han solidarizado con les compañeres y también personajes públicos (directors de cine, periodistas, escritors, etc.). También profesors de universidad, e incluso algunos colectivos izquierdistas. Como hemos dicho, la ASI es bastante más influyente de lo que en el resto de Europa se piensa. ¿Cuál es la situación actual del resto de colectivos antisistema en Serbia? Como ya he comentado antes, el estado serbio lleva a cabo políticas muy represivas. Una de las luchas más activas a día de hoy es el antifascismo, y una de las pocas donde todas las organizaciones están bastante unidas. Esto es así porque el fascismo es muy fuerte en Serbia, incluso en el mismo parlamento. Cabe destacar que el movimiento fascista tiende a enfocar su campaña en contra del anarcosindicalismo. Como paso, por ejemplo, hace apenas un par semanas cuando hicieron una fuerte campaña en contra de la ASI. Me atrevería a decir que el fascismo serbio no centra su lucha contra el antifascismo liberal. Su enemigo real es el anarcosindicalismo, lo que demuestra, y no me cansaré de repetirlo, el gran trabajo que ha hecho la ASI. De hecho, la ASI fue la promotora de la BAFI (Iniciativa Antifascista de Belgrado). Para terminar, ¿alguna propuesta para ayudar a les compañeres preses? Creemos que es muy importante apoyar esta campaña porque puede sentar precedente en la represión contra el movimiento anarquista de los países balcánicos. Debemos continuar sin descanso la campaña de solidaridad, informando a la población para lograr un aumento de la presión pública. Hay que dar apoyo a todo lo que necesiten. Ahora mismo uno de los mayores problemas es la falta de fondos para sufragar gastos judiciales, posibles sanciones, multas, etc. Dada la gravedad del asunto creemos que hay que empezar a buscar nuevas vías de solidaridad. Eso sí, siempre utilizando métodos que no perjudiquen ni aumenten los cargos. Remarcamos que se está juzgando a les compañeres bajo acusación de terrorismo internacional. Muchas gracias por el interés mostrado. ¡Salud! Yes, that's the one. I just assumed it was a new interview that hadn't been translated.